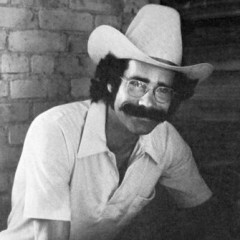 As many of you know, we lost my old compadre Sean Blackburn in September, 2005. Sean and I worked together for ten years, singing, playing and traveling. He was my brother. 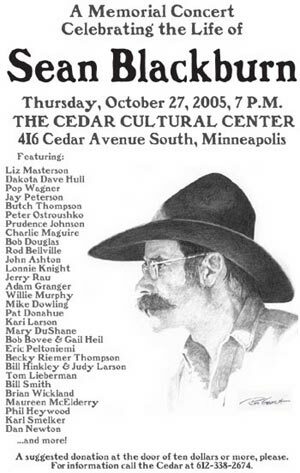 In October we did a big memorial concert for him here in Minneapolis at the Cedar Cultural Center. In addition to myself, it featured performances by Liz Masterson, Pop Wagner, Jay Peterson, Butch Thompson, Peter Ostroushko, Prudence Johnson, Charlie Maguire, Bob Douglas, Rod Bellville, Cal Hand, John Ashton, Lonnie Knight, Jerry Rau, Adam Granger, Willie Murphy, Mike Dowling, Pat Donahue, Kari Larson, Mary DuShane, Bob Bovee & Gail Heil, Eric Peltoniemi, Becky Riemer Thompson, Bill Hinkley & Judy Larson, Tom Lieberman, Bill Smith, Phil Heywood, Dan Newton, Karl Smelker, Andy Cohen and a few others, I think.